Grab your lab coats and get ready to flex your scientific mind as you complete science experiments and projects that will have you and your little geeks yearning for a lab to call your very own. 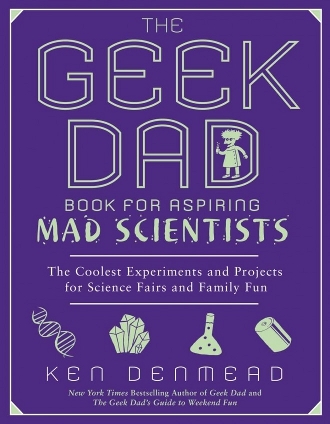 Once again, Ken Denmead, author of Geek Dad and The Geek Dad’s Guide to Weekend Fun (which we absolutely loved), has given Parent Geeks around the world an outstanding book to add to our ever-growing family library. 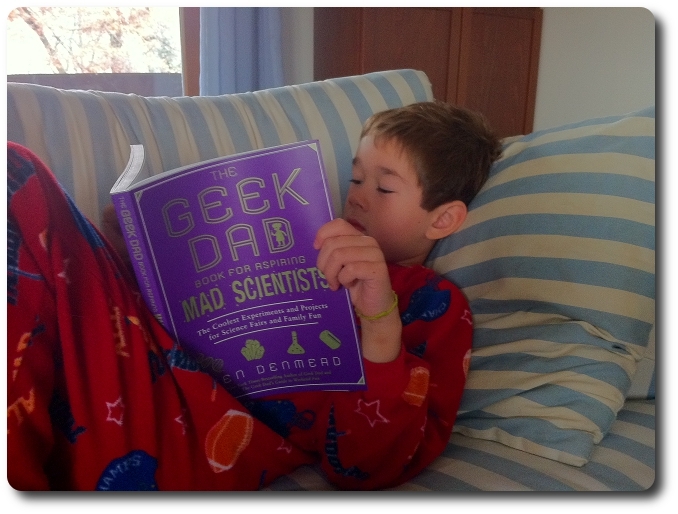 His newest book, The Geek Dad Book for Aspiring Mad Scientists, is focused on getting little geeks interested in and falling in love with science, to be inquisitive about the world around them, and never stop asking “why”. You and your little geek will be given step-by-step easy to follow instructions and challenged as you follow and complete the experiments yourself. Each experiment is broken down by cost, difficulty, and duration, which makes it very easy to review each experiment to determine the time and energy that will be needed. Included in the book is a very handy index that lists all the experiments (along with their cost, difficulty, and duration) for quick and easy reference on the go. The same information is presented at the beginning of each experiment in further detail, including the necessary tools and materials, offering an excellent summary of what is to be expected and gained. The experiments are grouped into four main sections that cover a very wide breadth of topics ranging from building your own wind tunnel to raising your own triops. The difficulty ranges from fun to do experiments with your little geeks to full-blown science fair projects complete with lasers and computer programming. 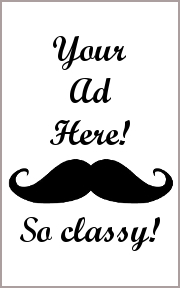 Looking to learn more about the environment and the effects of toxins? Try the “Biosphere Breakdown” experiment where you get to create a closed environment and then introduce chemicals to see the damage that ensues. Interested in how ancient armies of the past waged war against great cities? Learn about the miraculous trebuchet by completing “The Science of Siege Warfare” experiment and improve an already devastating weapon of destruction from the past. Or, perhaps you’d rather learn just how many calories are in that microwavable chicken patty? Then you should complete the experiment, “Understanding Calories: Junk Food in Flames”. There is something for everyone in this book and nothing that won’t amaze your little geeks. 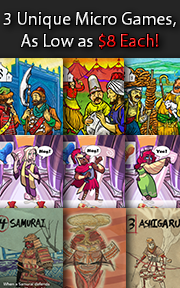 Like its predecessors, the book includes helpful illustrations to engage and help you through the projects. Even the most complex scientific tasks are so clearly and cleanly described, both with the step-by-step instructions and the illustrations, that you will never have any issues completing the experiments. Best of all, everything in this book is really just a launching pad. The experiments presented are intended to stimulate the mind and to set the reader down the path of enthusiastic scientific experimentation and critical thinking. The way I figure it, the more people I tell about the book, the more people will buy the book, and the more books Ken Denmead will write. It’s win-win-win all the way! When I heard that a new book was going to be offered, I immediately wrote my contacts in the publishing world and asked them when the book was going to be released and why I couldn’t have it now. They gave me the typical answer you’d expect. Stuff like “not out yet because it isn’t finished” and dates in the future that really had little to do with the here and now. Frustrated, I shared the news with my little geeks who were just as excited as I was (if not more so), and they too asked me the exact same questions I had asked the publishers. When I relayed the answers I was given, they sulked with me and we collectively drowned our sorrow watching Voltron (the one with the Lions – because that’s the only “true” Voltron, folks) and drinking chocolate milk. Like father, like son. Geeks are geeks, through and through. You get us excited and we quickly surpass your expectations and become totally enthralled and overly idiotic with our mania. Then again, that’s what makes us so adorable, too. Like his other books, Denmead uses science and math with his projects in a way that is fun, light, and educational. In this, his newest book, he focuses purely on the science but not once does he reduce the level of fun. Educational? Without a doubt and also very eye-opening. There were a number of times that even I was surprised with the outcome when I should have known full well what to expect. Just goes to prove that we never stop learning. The science experiments in the book are a lot of fun and challenging. They ramp up quickly from “easy to do” to “jeepers, we’re going to need a couple of weeks for this.” Not once, however, does the book lose its ability to easily communicate to you what you are going to do, why you should bother doing it, and what you should expect at the end. This will make even the most challenging of experiments as easy to accomplish as the most simplistic experiments in the book. True, they will take longer and have much more to work through, but not once should you ever feel overwhelmed. There is an excellent mix of experiments to be had. The focus swings wildly from your own backyard with a pen and pencil for quiet observation to a trip to your local electronics store to buy a laundry list of bits and pieces. The diversity is as entertaining as the experiments themselves and in no time you’ll be feeling like a real scientist – although, you’ll most likely not be driven mad. Parent Geeks, what a wonderful book for you and your little geeks to share! As parents, we can be very busy and have difficulty stopping to take a moment to look at the world. The quick pace of our lives sweeps up our little geeks as we carry them along with us. This book will help you stop, take notice, and ask questions we seldom have time to truly get answers to. There is a great mix of experiments that will fit in with your schedule and challenge you and your little geeks as much or as little as you like and time allows. In no time, you’ll be completing science experiments with your little geeks and be all the more wiser, too. Child Geeks, get ready to get your hands dirty and your minds racing. This book has so many wonderful things to do with your parents and friends that you’ll say “good-bye” to your video games forever! Well, OK, probably not, but by questioning the world around you and looking for the answers to how and why things work, you’ll find that your own backyard is a place of wonder and mystery. Also, lasers! Once again, Denmead has compiled a wonderful list of activities for the family. My little geeks and I have had a great time reading and completing them together. The real joy of this book comes from working and learning as a family and sharing your observations and enthusiasm. I have barely scratched the surface of what this book has to offer and look forward to completing the more complex projects with my little geeks. Until I do, we are enjoying the easier experiments and learning, laughing, and enjoying every moment in wonder and excitement. What a wonderful review, Cyrus, thanks so much! HOLY CATS! The MAN who I consider one of my inspirations for Father Geek and is a well known published author thinks I wrote something well? I feel a fainting spell coming on…. Much thanks for the kind words, Ken, and thank you for another wonderful book! My little geeks and I are really enjoy it! Today, small scientific experiments. Tomorrow, an unstoppable robot army to take over the world! BWAHAHAHAHAHAHAA! Great Review. I just ordered the original and have this on my wishlist. I hope this can jumpstart some interest and curiosity in my little one. She’s bright, but sometimes less than curious about things. There are so many neat things to do in these books that I think it will be a great way to have some fun, learn, and start to look for more info. Much thanks for the praise, Peter! I have no doubt your little geek, while reluctant at the moment, will soon be super excited about the science experiments in this book once you successfully demonstrate to her how cool science is! I strongly suggest you start out with the smaller and faster experiments if you are finding it difficult to keep her interest.